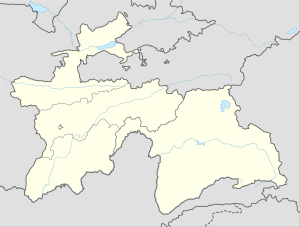 Dushanbe (Tajik: Душанбе, IPA: [duʃænˈbe]) is the capital and largest city of Tajikistan. Dushanbe means Monday in the Tajik language, the local language. It was named this way because it grew from a village that originally had a popular market on Mondays. As of 2016[update], Dushanbe had a population of 802,700. It was at the crossroads, where a large bazaar occurred on Mondays, hence the name Dushanbe-Bazar (Tajik: Душанбе Бозор, Dushanbe Bozor) from Dushanbe, which means Monday in the Persian language, literally – the second day (du) after Saturday (shambe). In the village, there were more than 500 households and a population of about 8,000 people. A Tajik Soviet Socialist Republic separate from the Uzbek SSR was created in 1929, and its capital Dyushambe was renamed Stalinabad (Russian: Сталинабад; Tajik: Сталинобод Stalinobod) for Joseph Stalin on 16 October 1929. In the years that followed, the city developed at a rapid pace. On 10 November 1961, as part of de-Stalinization, Stalinabad was renamed back to Dushanbe, the name it retains to this day. Severe rioting occurred in February 1990, after it was rumored that the Soviet government planned to relocate tens of thousands of Armenian refugees to Tajikistan. The Dushanbe riots were primarily fueled by concerns about housing shortages for the Tajik population, but they coincided with a wave of nationalist unrest that swept Transcaucasia and other Central Asian states during the twilight of Mikhail Gorbachev's rule. Dushanbe became the capital of an independent Tajikistan in 1991. In January 2017, Rustam Emomali, current President Emomali Rahmon's son, was appointed Mayor of Dushanbe, a move which is seen by some analysts as a step to reaching the top of the government. in 2016 was about 802,400 and was made up of ethnic Tajiks (c. 84.4%), Uzbeks (9.1%), Russians (4.1%), and others (2.4%). Tajik Air had its head office on the grounds of Dushanbe Airport in Dushanbe. Somon Air has its head office in Dushanbe. The Dushanbe trolleybus system operates public buses in the city. Automobiles are the main form of transportation in the country. The Uzbekistan border is about 50 km away and there is a road that links it to the Uzbek town of Denov. Roads to the north link it to the Sughd Region and from there to parts of Uzbekistan and Kyrgyzstan. The road to the south goes to Afghanistan, accessible via the bridge at Panji Poyon 150 km away. as of 2014[update] many highway and tunnel construction projects are underway or have recently been completed. Major projects include rehabilitation of the Dushanbe – Chanak (Uzbek border), Dushanbe – Kulma (Chinese border), Kurgan-Tube – Nizhny Pyanj (Afghan border) highways and construction of tunnels under the mountain passes of Anzob, Shakhristan, Shar-Shar and Chormazak. ^ a b D. Saimaddinov, S. D. Kholmatova, and S. Karimov, Tajik-Russian Dictionary, Academy of Sciences of the Republic of Tajikistan, Rudaki Institute of Language and Literature, Scientific Center for Persian-Tajik Culture, Dushanbe, 2006. ^ "The Last Khan". 8 March 2016. Retrieved 18 January 2018. ^ a b "Regions: Dushanbe & Surroundings". Official Website of the Tourism Authority of Tajikistan. Committee of Youth Affairs, Sports and Tourism. Archived from the original on 22 November 2012. Retrieved 10 May 2013. ^ "Dushanbe: History". Lonely Planet. Retrieved 10 May 2013. ^ "1956- De-Stalinization - Mr. Whalen- Suffern High School". sites.google.com. ^ "Tajikistan: regime eternalization completed?". The Politicon. The Politicon. 26 January 2017. Retrieved 26 January 2017. ^ a b "Updated Asian map of the Köppen climate classification system". ^ "Tajikistan: Citizens Ponder Bleak Future Amid Harsh Winter - Eurasianet.Org". ^ "Klimatafel von Duschanbe / Tadschikistan" (PDF). Baseline climate means (1961–1990) from stations all over the world (in German). Deutscher Wetterdienst. Retrieved 18 February 2016. ^ "Dushanbe Climate Normals 1961–1990". National Oceanic and Atmospheric Administration. Retrieved 18 February 2016. ^ "Tallest unsupported flagpole". Guinness World Records. 24 May 2011. Retrieved 14 December 2011. ^ "Tajikistan: Provinces, Major Cities & Urban Settlements - Population Statistics, Maps, Charts, Weather and Web Information". www.citypopulation.de. ^ "Шумораи аҳолии Ҷумҳурии Тоҷикистон то 1 январи соли 2016 Ахбороти Агентии омори назди Президенти Ҷумҳурии Тоҷикистон" (PDF). Archived from the original (PDF) on 10 August 2017. Retrieved 22 July 2017. ^ "Directory: World Airlines." Flight International. 30 March-5 April 2004. 78. "Titov Street 31/2, Dushanbe Airport, Dushanbe, 734006, Tajikistan."